Amazing Technology: Meet The Transparent Solar Cell! Made of photoactive plastic, the new transparent solar cell is 70 per cent transparent to human eye so you can still see outside. 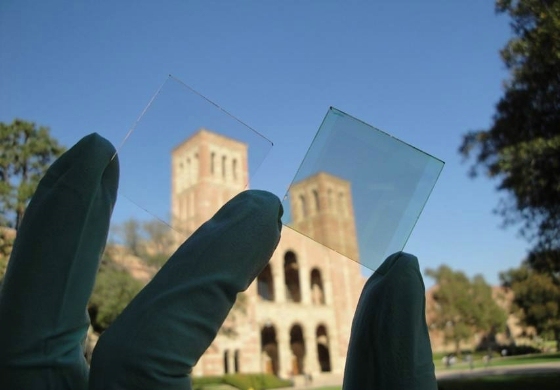 UCLA researchers have developed a new see-through solar cell for windows that generate electricity. According to the researchers, it is an advance toward giving windows in homes and other buildings the ability to generate electricity while still allowing people to see outside. In other words, these transparent solar cells could one day be used to build solar windows or even sun collecting smartphones. The UCLA team says that the new kind of polymer solar cell (PSC) produces energy by absorbing mainly infrared light, not visible light, making the cells almost 70 per cent transparent to the human eye. They made the device from a photo active plastic that converts infrared light into an electrical current. Their study has been published in the journal ACS Nano. "These results open the potential for visibly transparent polymer solar cells as add-on components of portable electronics, smart windows and building-integrated photovoltaic and in other applications," said study leader Yang Yang, a UCLA professor of materials science and engineering. Yang is also director of the Nano Renewable Energy Center at California Nano Systems Institute (CNSI). According to Yang, there has been intense worldwide interest in so-called polymer solar cells due to their advantages over competing solar cell technologies. "Our new PSCs are made from plastic-like materials and are lightweight and flexible," he said. "More importantly, they can be produced in high volume at low cost." Scientists are said to be investigating these PSCs for their potential in making unique advances for broader applications. Several such applications would be enabled by high-performance visibly transparent photovoltaic (PV) devices, including building-integrated photovoltaic s and integrated PV chargers for portable electronics.